Tom Bermingham at Atlantic College, Dublin. Tom Bermingham contacted me recently and advised me that he had written an article for QSO in 2010 relating to his time at Atlantic College in Dublin and that it might be useful for this section of the website. 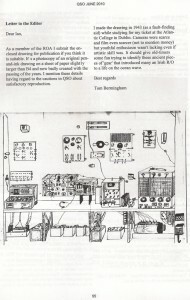 It was in the form of a letter and we have scanned the original letter in QSO and reproduce it here. We have relatively few members who served in World War 2 and it most interesting to see the equipment that R/O’s trained on. Tom says that cameras and film were scarce but one wonders whether a photograph would have been allowed at all had the training taken place in, say, Liverpool, instead of Ireland which was a neutral country at that time. My guess is that the answer to that is no.